The SpaceFluoro product family has a wide range of diametres suitable for competition anglers, streamer fanatics and saltwater/pike bums for both fresh and saltwater environments. A superb, new-generation 100% Fluorocarbon, manufactured in Japan using the very latest 21st century technology, producing a leader material of extreme quality and smoothness. 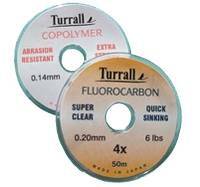 Exhibiting all the benefits of modern day fluorocarbons, the advanced technology has specifically identified and enhanced the characteristics required for the perfect, tough, high quality line demanded by todays progressive fly fisher. 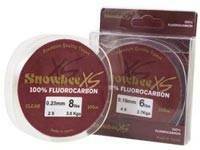 XS Fluorocarbon has every feature one needs for the best subsurface, low visibility leader material.  21st century premium quality 100% fluorocarbon.  Low stretch and water absorption for the ultimate in consistent performance.  High knot strength to diameter ratio.  Super fine and low refractive index for truly minimal visibility in all light and water conditions.  Silky smooth with superb knot strength.  Excellent abrasion resistance and low memory.  Strong yet very supple for superior presentation. 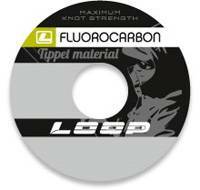 Leader material manufactured in the highest quality fluorocarbon. Higher density than nylon guards against abrasion and allows material to sink easier. Nearly invisible in water. 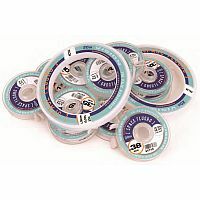 Note: Fluorocarbon does not break down when left out in the elements  do not litter! Prisma is totally new fluorocarbon in our range. It has great knot strength and it is easy to tie, thanks to a special coating and slightly bigger stretch. It is still hard material so it gives you great turnover if you are using heavily weighted flies and because of fluorocarbons density it sinks, making it ideal for wet fly use. Prisma, like all other Vision tippet materials, come in colour coded, snap together & rotate spools. 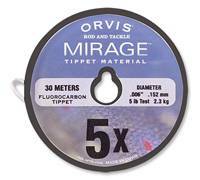 Orvis Mirage monofilament fluorocarbon tippet is ideal for all saltwater fly fishing, plus steelhead and Atlantic salmon. Also for freshwater nymphing where trout are leader-shy. Refraction index on Mirage is very close to water which makes it near invisible to fish. Often you can go up one tippet size and still gain the same results, plus it tends to sink, making it an excellent tippet for nymphing and streamer fishing. Mirage offers superior abrasion resistance which is critical in many big game and saltwater applications where structure and hard mouths can cause increased abrasion. 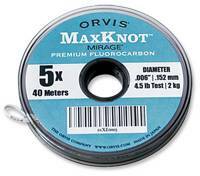 Orvis monofilament fluorocarbon leader material has a leader retainer on each spool. 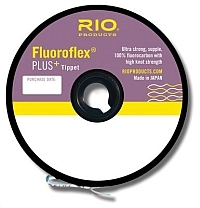 Introducing the only tippet material any serious fly fisherman should consider using, with the best combination of wet-knot strength, suppleness, and abrasion-resistance of any fluorocarbon material made. Greater wet-knot strength means more fishbig fishget landed. Plus, you fish more and re-tie tippet less. technology, to produce a genuine Fluoro-polymer with superb fishing characteristics. 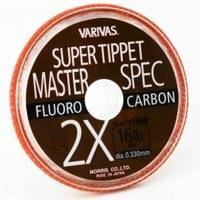 Exhibiting all the benefits of modern day fluorocarbons, the technology has improved to specifically identify and enhance the characteristics required for the perfect fishing line. 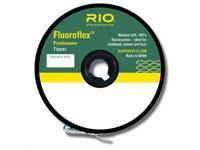 Fluoro-tec has all the qualities in the perfect combination, to produce just that - the ultimate clear water leader! A top quality Fluorocarbon line, which can compete with double strength monofilaments in terms of breaking strain/diameter ratios.  Low stretch, high sensivity.  High specific gravity allows it to cut quickly through the surface film.  Sinks at a controlled rate.  High knot strength, low diameter. Trout Fisherman say that this line is tough, durable, exceptional value, and the most reliable around. It holds its knot strength, doesn't suffer from abrasion, is favoured by competition anglers, and does what it says it does! We couldn't have put it better ourselves. No wonder it is the market leader and primary choice for fly fishers everywhere! 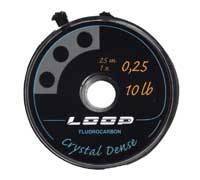 Guaranteed 100% clear fluorocarbon and SG slightly higher than water helping it to sink and become almost invisible. State-of-the-art. Virtually invisible in water. Super-soft for perfect turnover. High abrasion-resistance A great all-round choice. Specially suited to sub-surface and still-water fishing. Presentation is possibly the most critically important factor in the quest to increase bites and catch rates. Our goal with Power Silk was to deliver ultimate presentation to the competition angler as well as maximum strength.